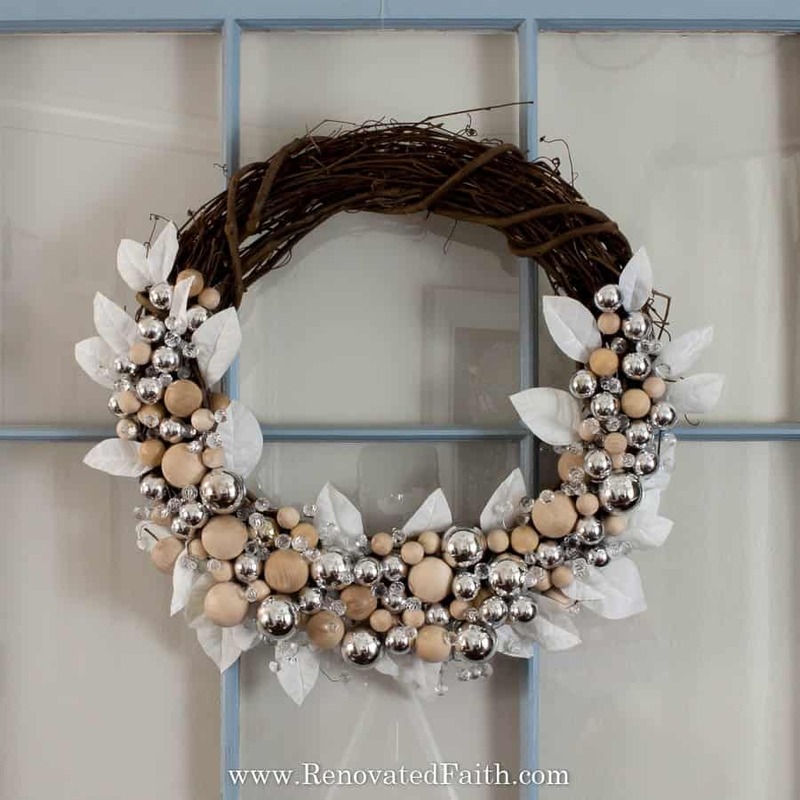 This rustic glam Christmas wreath is such a gorgeous addition to your front door or mantel. 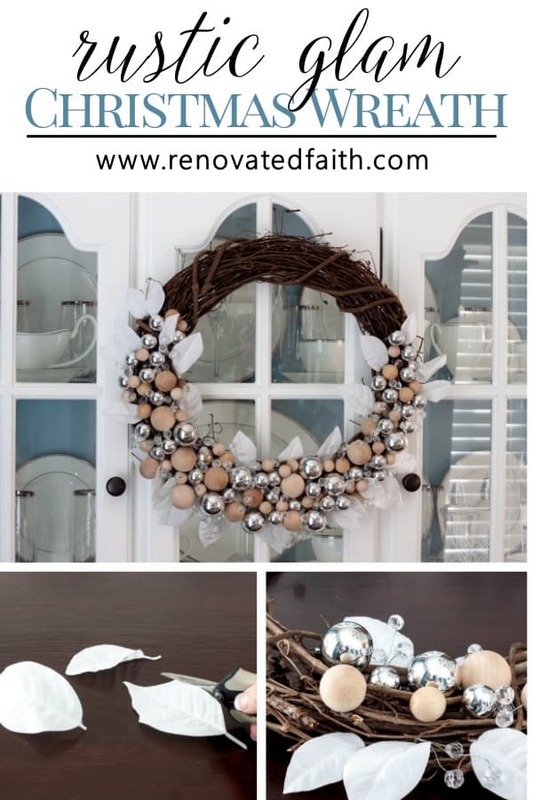 In this tutorial, I show you how to easily decorate a Christmas wreath with ornaments and wood balls. This post may contain affiliate links for your convenience at no extra cost to you. You can see my full disclosure here. ✅CLICK HERE for the best source for assorted wood balls. 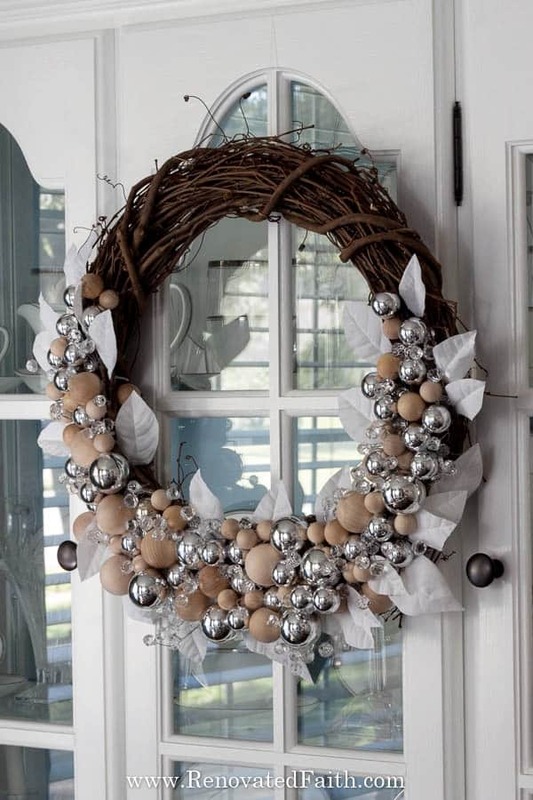 Although this wreath definitely has a farmhouse chic vibe, its neutral colors can work well with any Christmas décor. This is actually my own knock-off of a wreath sold at Horchaw for over $200. It’s no longer being sold but you can own version for MUCH less with this guide. 18” Grapevine Wreath – See the current price here online but it’s probably much cheaper at Hobby Lobby. Assorted Wood Balls – For the wooden balls on your Christmas wreath, amazon has a set here with assorted sizes. (Click to see the current price here). The sizes I used were 1.25″ and 0.75″ which this listing has. 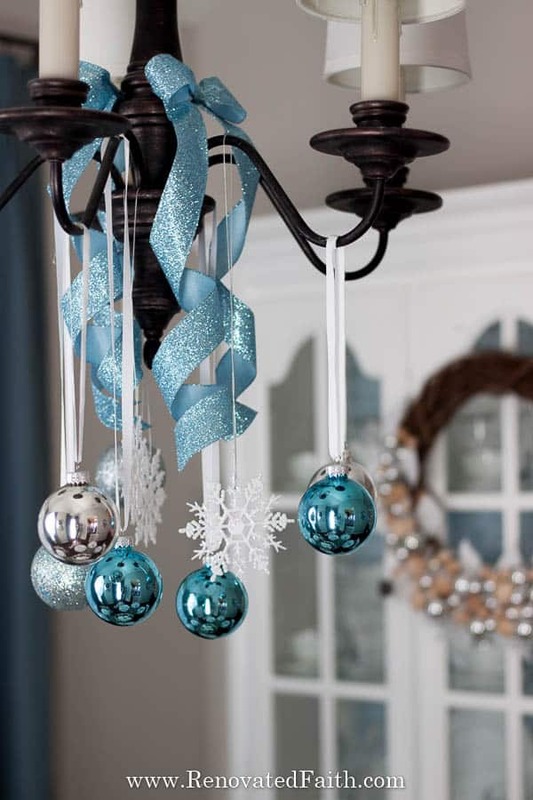 Silver Ball Ornaments – Mine were approximately 1” and 1.5” and I got them at the Dollar Store but I’ve seen both at Hobby Lobby. 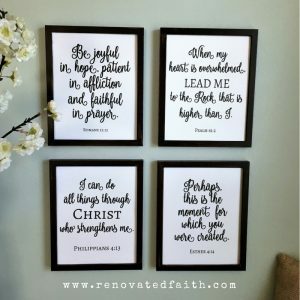 Picks with Clear beads – I got mine at Hobby Lobby. You can see a better picture of these in my JOY Wreath Tutorial here. 1 “Bunch” of White Poinsettias – By that I mean 1 branch with 5-6 flowers on a stem, which was enough to make the white leaves for my wreath. 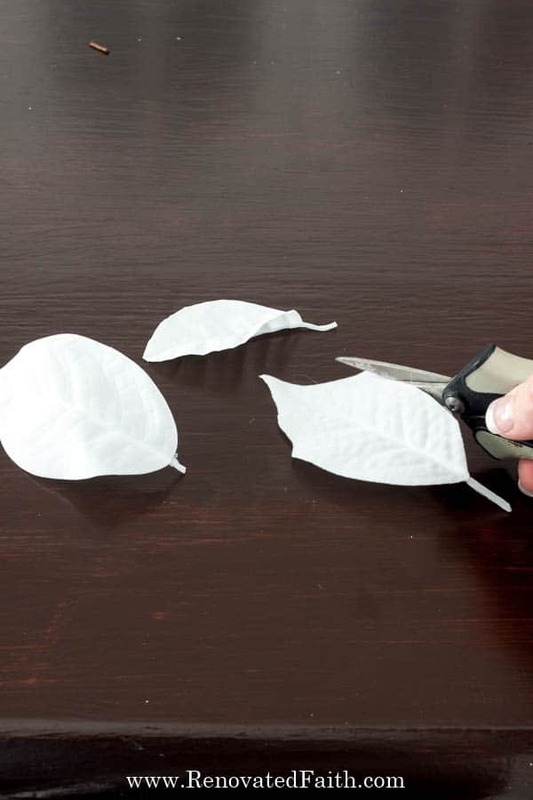 You will need almost 40 of those petals to make your white leaves. (You want the ones that look kind of cheap, because they work the best. One bunch at Hobby Lobby was about $5). Hot Glue Gun – I like this hi-temp mini glue gun! Hot Glue – I would make sure to have plenty on hand – here is my favorite brand! 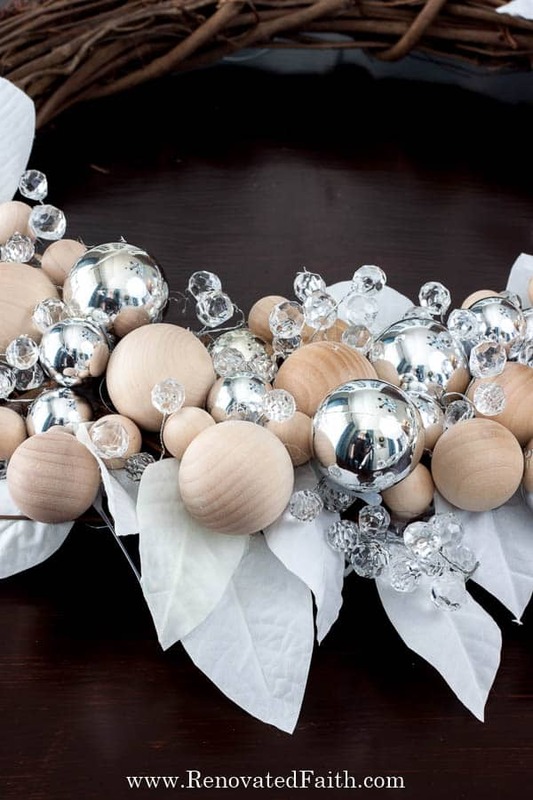 Add the larger silver ornaments and wood balls first throughout the wreath with hot glue. Leave a lot of room for the small ornaments in between. Put wax paper underneath your wreath in case your hot glue drips through onto your work surface. In some cases, I had to put quite a bit of glue to make sure the balls were secure. 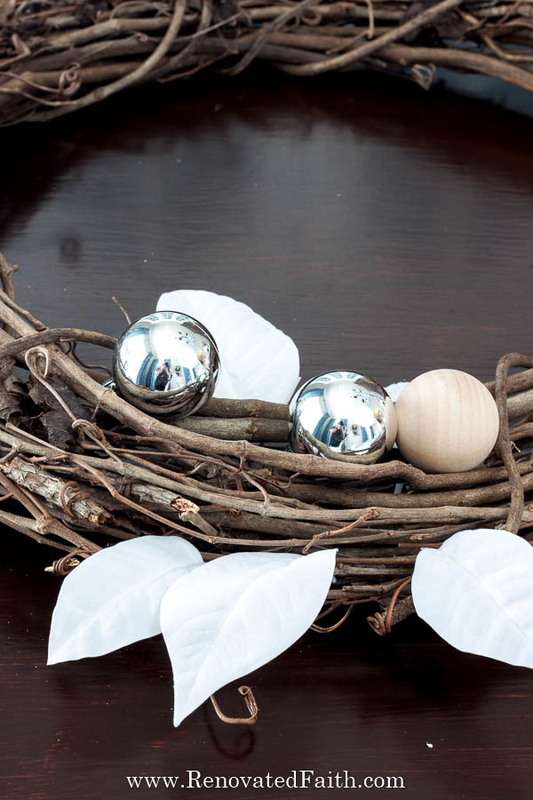 Feel free to add hot glue in between balls so they stick to each other – however you can get them to adhere to the wreath! This part is not difficult but don’t be afraid to use a lot of hot glue. I like to use this hot glue gun (check the current price here) and mine has lasted 7 years, even through a hair bow making business. Also, instead of using those little plastic stands that sometimes come with glue guns, set your glue gun in an old mug as a holder. It will keep it more steady and the tip away from your hands and the table. 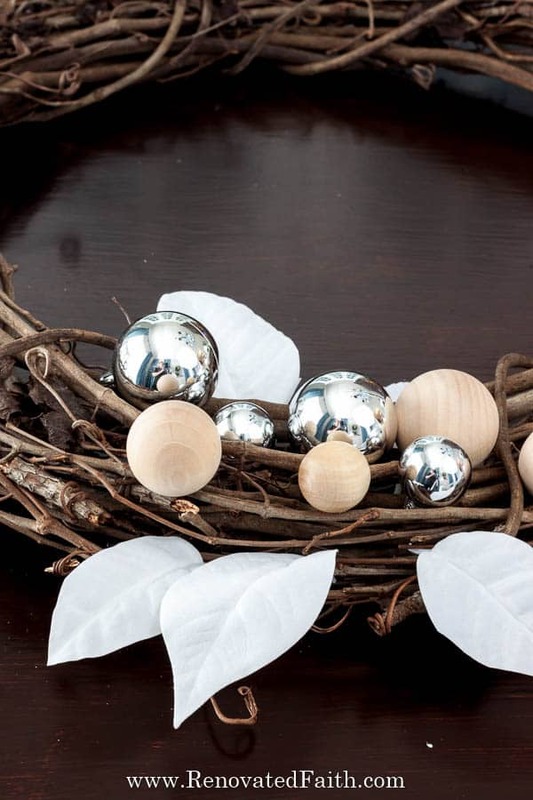 Can you make an Elegant Christmas wreath with cheap, plastic ornaments? All of the silver ornaments I’m using for this project are plastic. 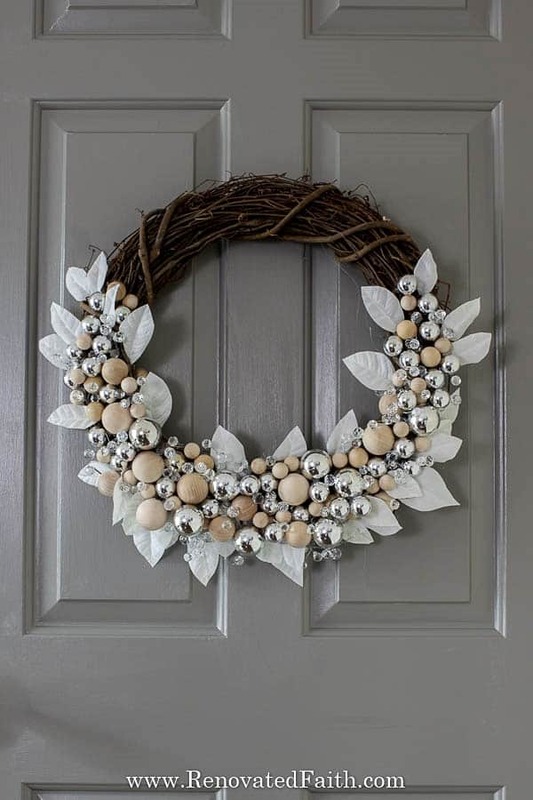 It seems counter-intuitive to use plastic ornament balls on a rustic GLAM wreath but no one will know the difference. Of course they are unbreakable but they are cheaper and will hold up better as your wreath is stored until next year. 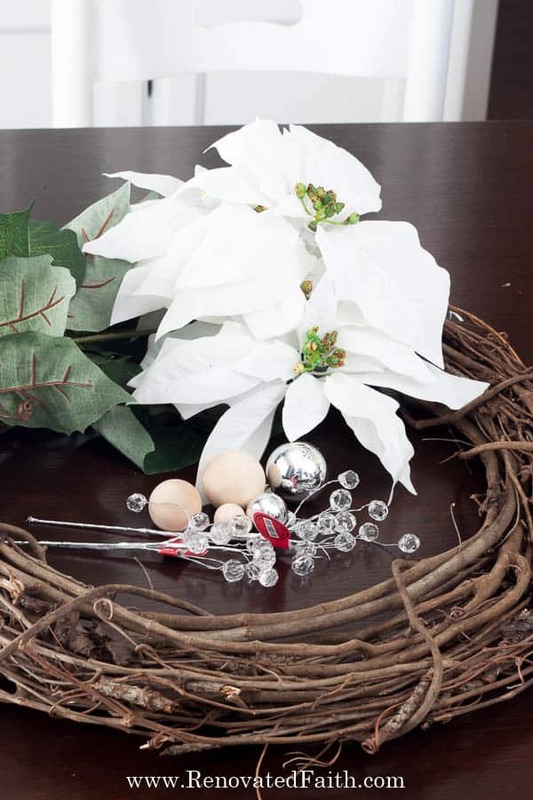 Cut off the petals of your white poinsettias to make the white leaves. I used about 38 leaves for my wreath which I was able to get from one $5 “bunch” of poinsettias. Cut each petal into a leaf shape like so. You want them to be about 1.5” to 2” in length. They don’t all have to be the exact same shape or size. In fact, it’s better if they aren’t because they make the wreath more interesting. Add in the leaves to the wreath sporadically as shown. I put more towards the bottom, a few on the inside and some smaller ones towards the top. 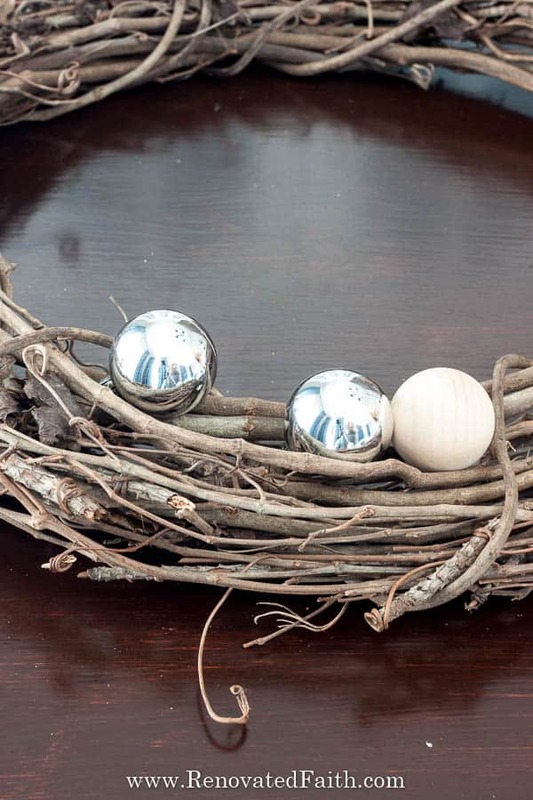 Add in your smaller ornaments and wooden balls at random. Try to fill in most of the gaps of the wreath at this point. This is where I add the clear bead picks that stick out just above the ornaments throughout the wreath. Before adding them I took them apart so they were in a few sections of 3 or 4 beads. Then, I inserted those throughout the wreath. I took a look at the whole wreath and filled in as needed. Than, I added fishing line to the back to hang it. You could also use a strip of burlap or a burlap bow like the one I made here. Make your own Christmas Wreath or Buy One? 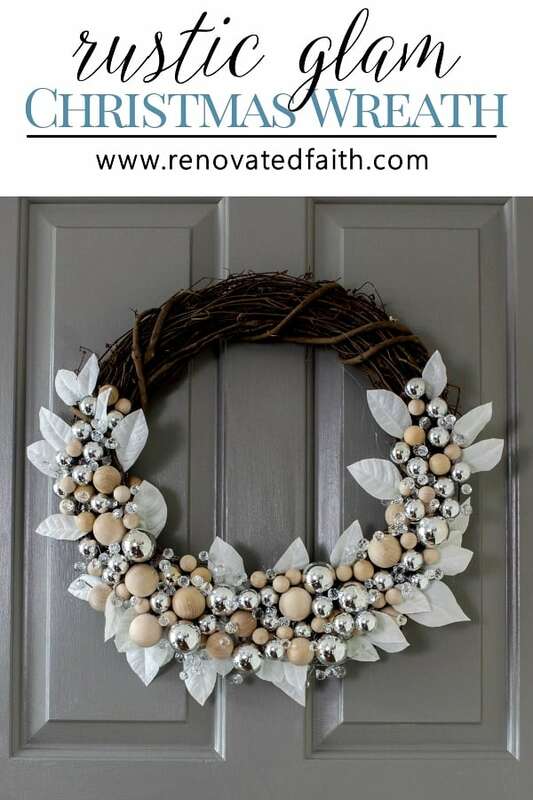 You can definitely find cute artificial Christmas wreaths like the ones here, but the beauty of making your own wreath is that you can customize the size, colors and accents to your own style and decor. Also, in most cases you will pay much less than buying one. 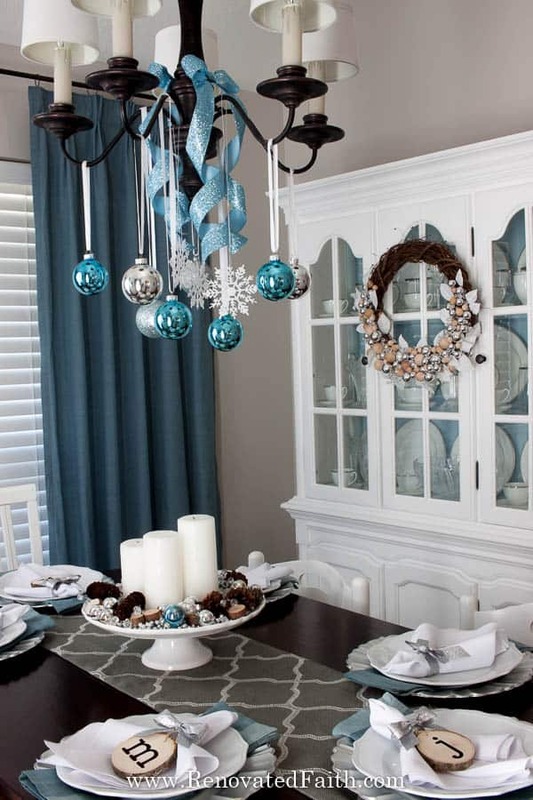 CLICK HERE to see more of my chandelier decor. CLICK HERE to see the tutorial for my Wood Slice Place Cards / Personalized Ornaments. For Christmas wreath ideas, Pinterest is of course a great source but go to high-end websites as well. For example, I got the idea for this wreath from a designer wreath at Horchow.com. The wreath is no longer sold but it was priced well over $200. I was able to make my own in about 30 minutes for less than $25! 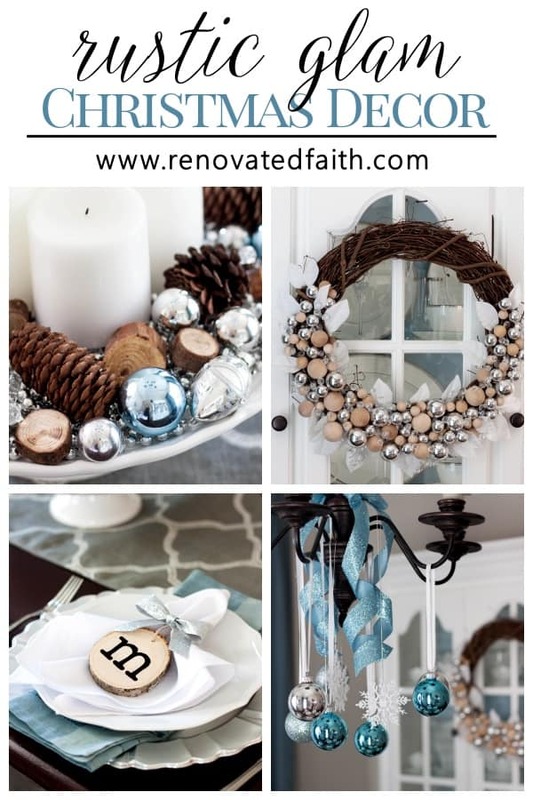 So for easy wreath decorating ideas, look at sites known for doing Christmas decor well like PotteryBarn.com, RestorationHardware.com and Horchow.com. They will have the best inspiration and you can make your own budget-friendly version! Did you like this post? Be sure to share it and feel free to sign up below to be on our email list!